The Nadia cathedral pearl bridal veil with blusher moves with captivating fluidity. This veil features Swarovski pearl details that capture the light in the most beautiful way. Each pearl detail has been masterfully applied and scattered across the full veil including the blusher layer – think twinkling pearls from your head to your toes for a look that’s contemporary and ultra chic. We designed this veil for lovers, dreamers and modern romantics. It’s the perfect finishing touch for decadent garden weddings or church nuptials. Designed and handmade in Australia. Worldwide shipping. Handcrafted from bridal illusion tulle. Hand embellished with Swarovski pearls. Attached to a metal hair comb for secure placement. Suits a range of hairstyles and wedding dress styles. Blusher layer to pull over your face. Colours: Bridal white or soft ivory. Colour samples in attached photos. Also, see styling tab below. Measurements: Cathedral length at 300cm (or as per your height and dress length). Customisable: Shorter or longer lengths available, including variations to the length of the blusher layer. Made to order: Production times in tab below. Styling advice: See tab below or contact us with photos of your wedding dress. Rush orders: Contact us to check availability for a rush order. We’re here to assist you through the styling process. If you are unsure whether this veil will suit your wedding dress, height and/or hairstyle, feel free to contact us through our contact page or send us an email directly (enquiries@taniamaras.com). You’re welcome to send us photos of your wedding dress, hairstyle and venue, and any other details which may help us understand your bridal vision. We’d love to hear from you. The Nadia cathedral veil is made to order. Please allow 8 weeks for production plus delivery times. Modifications can be made to this design to suit your hairstyle or wedding dress. Timeframes and costs for custom variations will need to be discussed and quotes agreed upon before ordering. The Nadia is the ultimate cathedral length veil that will drape beautifully behind you as you walk down the aisle. 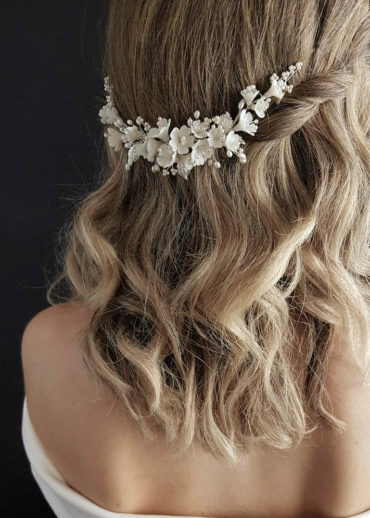 Its classic styling will become one of your most treasured pieces from your wedding day. We love to style it with lace wedding dresses of all kinds, modern silhouettes, and ultra feminine gowns. Our Nadia veil falls to 300cm from the comb to the end of the train. It can be customised to regal cathedral length at 350cm+ upon request. If you are unsure which length will best suit your wedding dress, please contact us with photos of your wedding dress and height and we can get back to you with a recommendation. The Nadia veil features a long blusher layer which is designed to be pulled over your face for the ceremony or to capture beautiful photographs throughout the day. The blusher layer can be worn back, if you wish, and creates a beautiful cascade detail at the side. The blusher layer can also be customised to suit your height and hairstyle. We love to style this veil with backwards facing headpieces positioned over the comb or wedding crowns for a seamless finish. Browse our full headpiece collection or contact us and we’d be happy to offer a recommendation based on your wedding dress and hairstyle. The Nadia is handcrafted from a lightweight bridal illusion tulle. It’s available in bridal white or soft ivory tones. We like to aim for a colour match or a shade lighter than your wedding dress. BRIDAL WHITE veil: Pair this with white, silk white or diamond white wedding dresses. SOFT IVORY veil: Pair this with off-white, light ivory, soft ivory or medium ivory wedding dresses. If your wedding dress features a lace overlay that is lighter in colour than the dress, we recommend matching the veil to the colour of the lace rather than the colour of the dress. Your veil will arrive beautifully packaged in our signature packaging. It will include care instructions and a small hanger to hang up your veil upon arrival. If you are unsure about styling this veil with your wedding dress, please feel free to contact us and we would love to assist you through the process.